1U rack-mountable keyboard, mouse, LCD console and optional integrated KVM Switch.Includes: C13-C14 power cord, Documentation CD, Firmware upgrade cable, Installation guide, NEMA 5-15 power cord, PS2 KVM cable, Rack mounting hardware, Single user rack mount kit, USB cable, USB KVM cable. The Rack LCD Console with Integrated KVM Switch combines the functionality of Rack LCD Console and Analog KVM switches in one convenient package optimizing U space in the rack environment, eliminating cable clutter, and offering a value of two products functionality in one package. Inclusief: Cable management arm, Cd met documentatie, Installatiegids, KVM-kabel, Rek inbouwbeugels, Gebruiksaanwijzing. 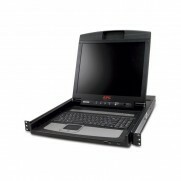 The Rack LCD Console with Integrated KVM Switch combines the functionality of Rack LCD Console and Analog KVM switches in one convenient package optimizing U space in the rack environment, eliminating cable clutter, and offering a value of two products functionality in one package. Includes: Cable management arm, Documentation CD, Installation guide, KVM cable, Rack Mounting brackets, User Manual.